Eye of the Beholder's Margaret Willingham will be sharing her love of reverse needle-turn applique using Trace! Baste! Snip! & Stitch! in some great projects. Majesty, Medallion IX (36" x 36"). can be made by hand or machine. Hand will be taught at Applique Away on Galveston Bay. Kit Fee: $87.00 includes; Majesty Medallion IX pattern, 1 1/4 yd. top fabric, 1 1/4 yd. background fabric, 1 1/4 yd. backing fabric, 1/2 yd fabric for binding, 1 spool quilting thread for basting, 1 spool of thread for reverse applique, 1 pack No. 7 Sharp needles for basting, 1 pack No. 11 Milliner's needles for reverse applique. Add a touch of elegance to your home with Rose Window, Medallion II. Finished, it is a stunning 21.5" square piece rich in intricate detail that is possible using her reverse applique process. Nothing is cut away until the design is traced and basted. 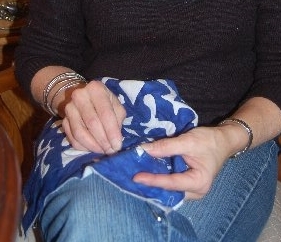 Then watch the beauty of the pattern peek out as you snip and stitch your way with sharp points and tiny round circles. You will love the results you get using this process, and you won't get hung up on the pins. Hand applique is a labor of LOVE, but when you trace, baste, snip & stitch! You can hang it, frame it, drape it on a table or stuff it to make an elegant pillow in your boudoir. Bring the beauty of a cathedral window into your home. Top fabric: Ruby Tonal. original top fabric. Background fabric-option 1: Light Grey Feathers. Similar to original background fabric. Background fabric-option 2: Pink Flourish. Come join the fun! Meet some new quilting friends and bask in the atmosphere of creation!